With the increasing warmer climate in Singapore, what steps are you taking to protect your skin? The urban lifestyle we are in exposes our face to many forms of harmful environmental factors, including fine particles pollution, toxic gases, and of course the most damaging of them all – ultraviolet (UV) rays! Thankfully, growing up I have been very conscientious and consistent with the application of sunscreen. My mummy is an avid advocator of sun protection mainly because she is well aware that freckles, pigmentation and ageing are all caused by the dreadful UV rays (which can be prevented)! On this note, I am truly appreciative of having a vain mum haha. While I have been using sunblock since I was thirteen, recently I am saddened to discover that my dark spots have started forming around my cheeks area :(( As such, protecting my face from harmful sunrays has become one of the TOP TOP TOP PRIORITIES in my skincare regime. 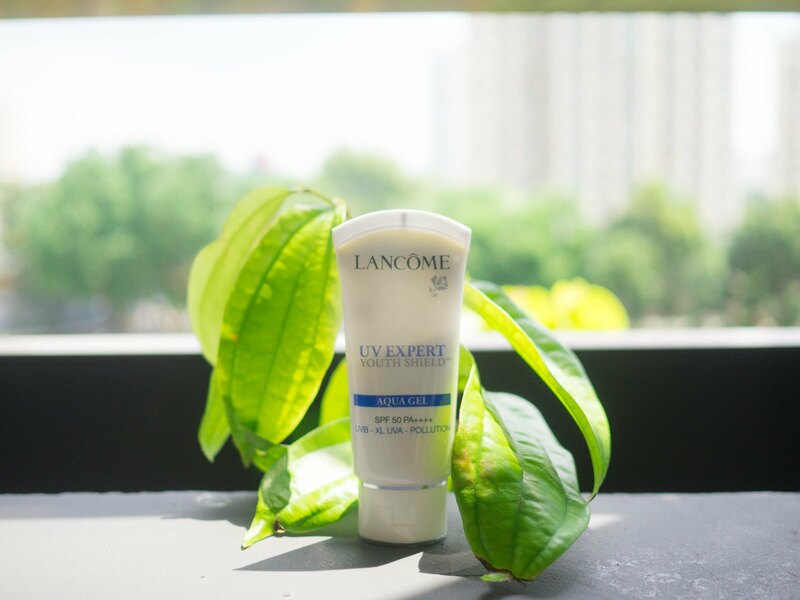 Lately, I have been introduced to Lancôme’s UV Expert Youth Shield™, Aqua Gel SPF50 PA ++++, a 12 hours active beauty shield, that is dedicated to city dwellers who want to avoid dark spots and signs of ageing, and boy, I am impressed by this product! Extremely lightweight –non-oily and non-sticky at all, it feels super gentle on the skin. When blended, it gets absorbed into skin in seconds. Perfect for people like me who is always rushing from places to places since application and blending only take mere seconds. With SPF 50 coverage, it provides adequate level of protection. If you are lazy like me, you’ll appreciate that the product is a broad spectrum 12 hours shield that helps protect your skin from those harmful pollution, infrared, UVA and UVB for the entire day when you are out! It goes on super sheer on my skin, unlike other brands that will make my face look gray, overly white or ashy. I like that it blends well under my makeup and also seems to mattify the skin shine.